2. Iris Linnaeus, Sp. Pl. 38. 1753; Gen. Pl. ed. 5: 24. 1954; Boiss., Fl. Or. 5: 117. 1882; Hook. f., Fl. Brit. Ind. 6: 271. 1892; R.R. Stewart, Ann. Cat. Vasc. Pl. Pak. Kashm. 63. 1972; Wendelbo & B. Mathew in Rech. f., Fl. Iran. 112: 13. 1975; B. Mathew, Iris (rev. ed.):1-215. 1989; SGBIS* (eds. 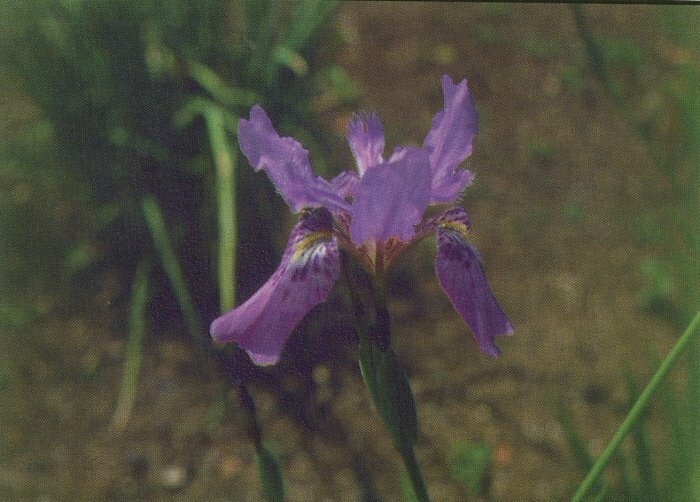 ), Guide species Irises 11-370. 1997. Herbaceous perennials. Roots fibrous, thin or fleshy. Rizome or bulb or stolon; aerial stem solitary or many, simple or branched. Leaves mostly basal, flat, equitant, canaliculate, 4-angled or terete. Bracts (spathes or spathe valves) 2 or more, subtending 1 or more flowers. Flowers solitary or in few flowered cymes; sessile or shortly pedicallate. Perianth segments 6, connate at base with the hypanthium, forming a short to well-developed tube, dimorphic, outer 3 are known as falls, usually differentiated into basal glabrous or bearded claw and a lamina which may have a beard or cockscome-like crest or unicellular papillae or only a smooth ridge. Inner 3 are known as standard. Colour variation is very pronounced; either the whole flower is of uniform colouring or bicoloured; then falls are normally darker. Stamens 3 attached to hypanthium, opposite the falls. Style branches 3, petaloid, each branch arched over a stamen and the claw of the fall, bilobed at the tip; stigma is represented as a flap on the outer side of each style. Capsule many seeded, seeds arillate or non-arillate. A genus of c. 300 species, distributed in Europe, Asia, N. Africa and North America; represented in Pakistan by 16 species.